No dialogue, none. Just Arnold screams. Wow, this is going to be a good movie. 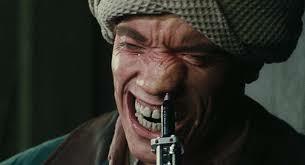 And then, Arnold eyes bulging out of a prosthetic Arnold face. Okay, I get it. This is going to be one of the best movies ever made. Hello listener, let's take an Interstellar trip. Doug Quaid (not to be confused with Dennis) is just an average, blue collar Austrian-American living in the future. He has an attractive wife and while he doesn't love his job, it's stable. But there's one thing in life he really wants, like, really really wants. And that's to go to Mars. However, since Hey Arnold can't afford a trip to Mars, he goes on a mind trip by way of a memory Inception device which spurs him to remember that he is a secret agent who had worked for Cohaagen but had switched allegiance to Kuato. Just so you're aware, Cohaagen is a man and Kuato is a speaking wart. Nonetheless, once the Memento of Quaid's old life comes back to him, he is hunted down like a beast, on earth, on mars, in the bright day, and during the Dark Knight. As he learns more about his Prestigeious career as a Cohaagen crony, he sympathizes more and more with the Dunquirky mutants of mars, like the "three breasted prostitute", and attempts to free them from the Danish yoke of Cohaagen by starting the reactor and making oxygen. Listener, this description is no doubt a confusing mess, But man Begins to understand the story more when one considers whether the entire story is but an illusion, an empty memory made to make old Quaid feel good about his life. Despite what the most accurate reading of the film is, two things are for certain: science fiction can really comment on the intricacies of humanity and Paul Verhoeven (not to be confused with Cohaagen) is a goddamn genius. Thank you for joining us listener. And if you must listen to one thing today, please listen to Arnold screaming. Also, Dean Norris is in this film and I'm pretty sure his character from Breaking Bad - Hank Schrader - suffered from Insomnia.